*One bar for both athletes. Deadlift + Touch-n-go Clean (any)+ Front Squat + Shoulder to overhead (anyhow). Both athletes must establish a 1RM in the first 7 minutes. Both athletes can load/unload bars and go down in weight after failed attempt. One athlete performs burpees at a time. Athletes share 1 bar, and work one at a time. Work can be split up however. 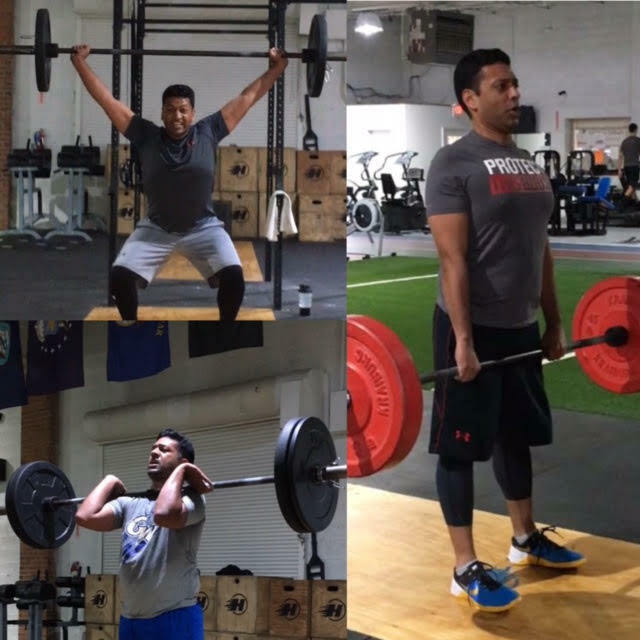 Arun Janakiraman is June’s Athlete of the Month. Learn more about why we have chosen Doctor J – Hyper CrossFIT’s resident Doctor who loves a great Chipper! – as this month’s Hyper CrossFIT athlete. How did you learn about CrossFit and how did you end up in our awesome Box? Like many other CrossFit athletes, I had been part of a traditional gym or worked out on my own. After sometime, the motivation to do a work out independently begins to wane. I knew some type of group class would keep me motivated, but I couldn’t find anything that really interested me. In 2014 a good friend of mine joined CrossFit and soon after he urged me. For various reasons, I couldn’t do it. (Looking back at it, those were of excuses!) In late 2015, I heard about Hyper CrossFIT and its proximity to my office. After about a month or so of putting it off, I walked into Hyper, met Yolanda and told her that I wanted to join. She offered me an intro class, which I declined and signed up on the spot. It’s the best decision I made. What do you like most about being a FIT member (Hyper CrossFIT Athlete)? I was drawn in by the workouts, but I keep coming back, because of the other members! I’m sure the WODs at all CrossFit boxes are great, but I really enjoy the camaraderie that we have at Hyper. This is the first time I’ve ever become friends with people at the gym. Whether you’re doing the Rx workout or a scaled version everyone is so supportive and cheering you on to keep pushing. Coming to Hyper is what I do to de-stress from the day. Everyone at Hyper is here to get a good a workout and have fun at the same time. It’s the best combination and environment to achieve fitness goals. What are you still working on to achieve? Honestly, a little bit of everything! I would like to be able to do any 21-15-9 WOD completely unbroken with my only rest being between exercises/movements. Tell us one random fact about yourself that has nothing to do with CrossFit. I love to travel and I try to go somewhere every chance I get. I have been fortunate to travel over 35 states and 30 countries. I would like to make it Australia, Indonesia, and South Africa someday. What is your favorite WOD or benchmark? There is no WOD that is my favorite during the actual workout. They’re all equally brutal. With that said, I really enjoyed “Death by Thrusters” and of course all of the “Athlete of the Month” WODs. I think I push myself a little more than usual during those workouts, because I don’t want to disappoint the featured athlete. If you created a WOD and named it after yourself, what would it be? The WOD would be called “Doctor’s Orders” and it would be either Rounds For Time or a chipper. There would be sled pull/push, squat cleans, wall ball shots, box jumps, hand stand push-ups, and maybe cash out with some wind sprints. Is that too much for one workout? What advice would you offer to someone interested, but intimidated to try CrossFit? If you’ve decided that you are interested in CrossFit then you’ve taken the hardest step. Don’t believe what you see on television. You don’t have to have a certain level of fitness to start. Everything will be modified based on your current abilities. CrossFit is nothing more than doing a boatload of squats while lifting weights, throw in some jumping and running and do it all at max effort. In all seriousness though, if you want to try, it will only take one hour of your time. For as much as we do for others daily, one hour to look after yourself is not a huge commitment. You’ll walk away feeling better about yourself and enriched by the people you’ve met. Be careful though, it’s addicting!